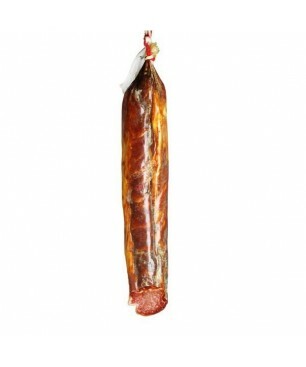 The Bellota Iberian Lomo is one of the most appreciated parts of Iberian pig fed on acorns. 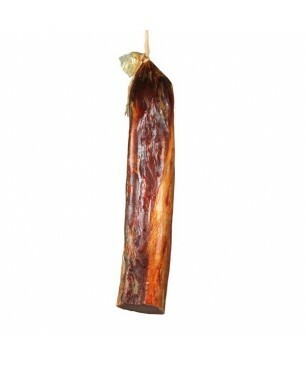 Its thinness layers of fat marbled into the iberian meat comes from the acorn diet of the pig. 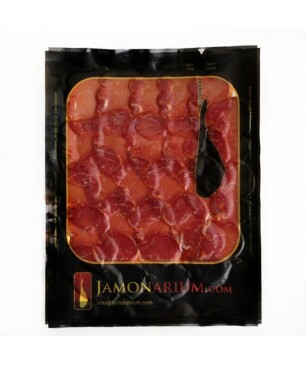 This is a quality feature of the authentic lomo Iberico bellota . The Iberian Bellota Lomo is one of the finest parts of the iberian pig, it is very well known and preciated in the spanish gastronomie. 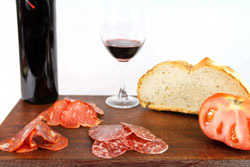 We recommend the bellota Iberian Lomo next to a piece of quality bread with olive oil, It is also perfect for gourmet Tapas and Snacks. It comes in two pieces and vacuum packed so that you get its full intact aroma. Preparation: It comes from each of the two pieces of meat that are next to the spine below the pig ribs. It’s marinated with salt, natural pepper and spices as it has been maked traditionally for many, many years. The curing process takes a minimum of 3 months to get a delicious iberian dish. Taste: Mild flavour, juicy and balanced with a unique texture due to the perfect combination of traditional recipe and care during its production. Curiosities: Reddish colour, mild aroma, juiciness, unique. It’s a pleasure for all the gourmets. Your product will be cut in pieces just when your order arrives. 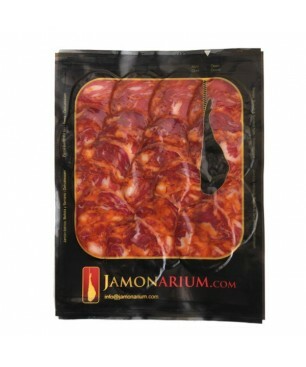 Then the product will be vacuum-packed to retain the original quality, aroma and flavour. he product is vacuum-packed in transparent plastic bags, just before it’s sent. Box with a handle for easy and secure transportation. A strap around the box ensures its safe transportation. We recommend you to take the product out of the plastic bag 15 minutes before eating it. The vacuum-packed products we sell can be stored in the fridge for a long time. Please check the expiry date of every product. LAETITIA P. el día 03/20/2018 Fera parti de mes futures commandes. Nicolas L. el día 08/29/2017 Mes enfants raffolent du lomo... Bellota bien entendu. Andrew K. el día 03/17/2017 Amazingly swift service... ordered Sunday arrived at my door Wednesday. Superb quality lomo.... I will be shopping here again! Franck N. el día 03/11/2017 Ce produit d'habitude sèche facilement, pas celui-là. Ce produit d'habitude est plus dur à couper, plus sec, c'est normal pour le filet; on dirait que ce lomo a été séché aux Baléares ou sur une île et qu'il en a conservé sa douceur. Ce produit plait beaucoup à nos clients. Franck Nicolle. Chef au restaurant l' Appart à Vittel. Richard S. el día 02/05/2013 I did a great choice to enjoy one of the best parts of the iberian pig, together with their D.O. Montsant wine. Good food and wine, with a high professional, reliable service, keeping me well informed till I receive the parcel. Walter K. el día 01/10/2014 Me gustaron mucho los productos, aunque el vino no lo he probado porque fue un regalo.Hay una cosa que me hubiese gustado encontrar: buen aceite de oliva, es una de las cosas que los espanoles que vivimos fuera echamos mas de menos, si en contrase botellas de buen aceite de oliva espanol por 7 euros, le hubiese comprado unas cuantas, teniendo en cuenta que aqui pago 5 euros por un producto de calidad media-baja.Espero que mi opinion pueda serles de utilidad. Andrés L. el día 01/09/2014 Greetings Alex,I am quite pleased with my order. I would definitely order again and would recommend you to anyone interested in Spanish food. Thanks. el día 03/19/2013 Es mi embutido preferido y lo he probado en varias regiones de España. 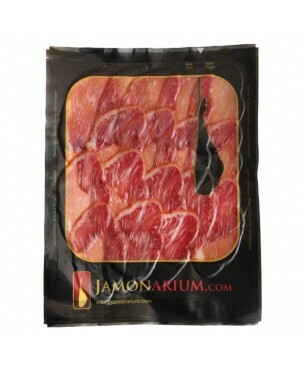 Por eso reconozco que la calidad y el servicio de Jamonarium es excepcional. Felicidades y gracias.